l Kang DJ, Endo A, Seo YJ. 2013. Effects of soil scraping on the reclamation of tsunami-damaged paddy soil. Journal of Crop Science and Biotechnology. 16: 219-223.
l Ishii Y, Hamano K, Kang DJ, Kannika R, Idota S, Fukuyama K, Nishiwaki A. 2013. 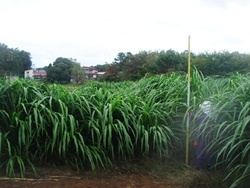 C4-napiergrass cultivation for cadmium phytoremediation activity and organic livestock farming in Kyushu, Japan. Journal of Agricultural Science and Technology 3: 321-330.
l Kang DJ, Seo YJ, Saito T, Suzuki H, Ishii Y. 2012. 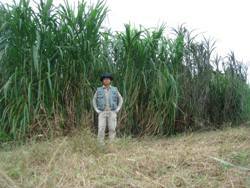 Uptake and translocation of cesium-133 in napiergrass (Pennisetum purpureum Schum.) under hydroponic　conditions. Ecotoxicology and Environmental Safety. 82: 122-126.
l 濵野　琴美・石井　康之・山野　明日香・森　康太郎・井戸田　幸子・姜　東鎮・西脇　亜也．2012. ネピアグラス（Pennisetum purpureum Schumach）のカドミウム集積能力の推定およびカドミウム汚染土壌の浄化に向けた乾燥技術の開発．日本作物学会九州支部会報．78: 21-24.
l Kang DJ, Futakuchi K, Seo YJ, Vijarnsorn P, Ishii R. 2012. 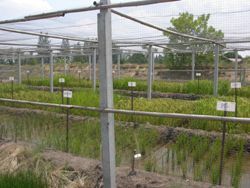 Evaluation of Al-tolerance on upland and lowland types of NERICA lines under hydroponic conditions. Journal of Crop Science and Biotechnology. 15: 25-31.
l Kang DJ, Futakuchi K, Seo YJ, Vijarnsorn P, Ishii R. 2011. Relationship of Fe-tolerance to morphological changes in roots in upland NERICA lines under Fe-treated hydroponic condition. Journal of Crop Science and Biotechnology. 14: 311-315.
l Kang DJ, Seo YJ, Futakuchi K, Vijarnsorn P, Ishii R. 2011. Effect of aluminum toxicity on flowering time and grain yield on differing in Al-tolerance rice genotypes. Journal of Crop Science and Biotechnology. 14: 305-309.
l Kang DJ, Ishii Y, Nishiwaki A. 2011. 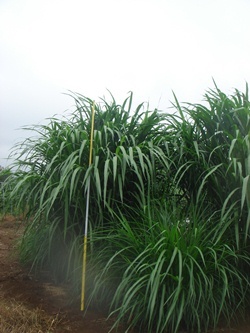 Effects of the shoot-cutting method on field propagation in napiergrass (Pennisetum purpureum Schum.). Journal of Crop Science and Biotechnology 14: 139-142.
l Kang DJ, Seo YJ, Ujiie K, Vijarnsorn P, Ishii R. 2011. Agronomic and tolerant performance of acid soil-tolerant wild soybean (Glycine soja Sieb. and Zucc.) in acid sulfate soil of Thailand. Plant Production Science. 14: 156-163.
l Higo M, Isobe K, Kang DJ, Maekawa T, Ishii R. 2011. Molecular diversity and spore density of indigenous arbuscular mycorrhizal fungi in acid sulfate soil in Thailand. Annals of Microbiology. 61: 383-389.
l Kang DJ, Seo YJ, Vijarnsorn P, Ishii R. 2010. Identification and crop performance of acid sulfate soil-tolerant rice varieties. Journal of Crop Science and Biotechnology. 13: 75-81.
l Higo M, Isobe K, Kang DJ, Ujiie K, Drijber RA, Ishii R. 2010. 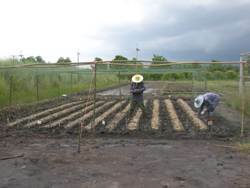 Inoculation with Arbuscular Mycorrhizal Fungi or Crop Rotation with Mycorrhizal Plants Improves the Growth of Maize in Limed Acid Sulfate Soil. Plant Production Science. 13: 74-79.
l Kang DJ, Nakanishi TM, Kume T, Ishii R. 2009. Determination of the rate of 18F-labeled water movement to the leaf and its association with water relations in acid soil-tolerant rice varieties. Journal of Crop Science and Biotechnology. 12: 257-261.
l Kang DJ, Futakuchi K, Dumnoenngam S, Ishii R. 2007. High-yielding performance of a new rice variety, IR53650 in mildly improved acid sulfate soil conditions. Plant Production Science. 10: 64-67.
l Satoh K, Ito C, Kang DJ, Sumida H, Takahashi R, Isobe K, Sasaki S, Tokuyama T. 2007. Characteristics of newly isolated ammonia-oxidizing bacteria from acid sulfate soil and the rhizoplane of leucaena grown in that soil. Soil Science and Plant Nutrition. 53: 23-31.
l Ghimire SR, Park SK, Kang DJ, Lee IJ, Shin DH, Kim SU, Kim KU. 2006. 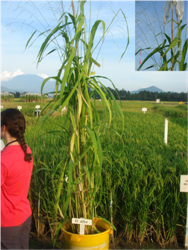 Physiological evaluation of transgenic rice developed for drought tolerance. Journal of Plant Biotechnology. 33: 133-137.
l Kang DJ, Ishii R. 2006. Formation of organic acids in the root apices of rice plants (Oryza sativa L.) grown in acidic nutrient solution containing aluminum. Plant Production Science. 9: 228-231.
l Kang DJ, Seo YJ, Lee JD, Ishii R, Kim KU, Shin DH, Park SK, Jang SW, Lee IJ. 2005. Jasmonic acid differentially affects growth, ion uptake and abscisic acid concentration in salt-tolerant and salt-sensitive rice cultivar. Journal of Agronomy and Crop Science. 191: 273-282.
l Yoon DJ, Lee JD, Kang DJ, Park SK, Hwang YH. 2004. Effect of electrolyzed acidic water on the growth of soybean sprout. Journal of Life Science. 14: 809-814.
l Kang DJ, Park DS, Lee JH, Oh BG, Ishii R, Lee IJ. 2004. Screening of submergence-tolerant variety and their physiological characteristics in rice. Korean Journal of Crop Science. 49: 126-130.
l Kang DJ, Ishii R, Kim KU, Lee IJ. 2004. 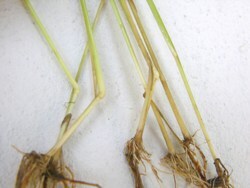 Changes of root system in rice (Oryza sativa L.) plant under salt- and drought- stressed agar medium conditions. Journal of Life Science. 14: 396-399.
l Kang DJ, Ishii R, Lee IJ. 2003. 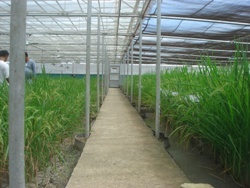 Water deficit in salt-and drought-stressed rice (Oryza sativa L.) seedlings. Bulletin of Institute of Agricultural Research of Kyungpook National University 21: 1-9.
l 姜　東鎮・呂　運尚・呉　乗根・姜　正勲・楊　世準・石井　龍一・李　仁中. 2003. 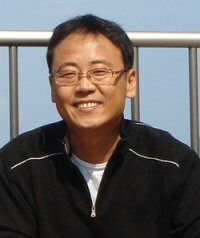 高温乾燥風に対する耐性イネ品種の生理学的特徴．日本作物学会紀事，72 : 328-332.
l 姜　東鎮・石井　龍一. 2003. イネの耐酸性機構に関する研究．第1報．酸性土壌耐性イネ品種の生理学的特徴．日本作物学会紀事，72 : 171-176.
l Kang DJ, Futakuchi K, Dumnoenngam S, Mechi T, Chakranon B, Ishii R. 2001. Factors related to differences in rice yield among districts in Narathiwat Province, southern Thailand. Japanese Journal of Tropical Agriculture. 45:49-56.
l Nakanishi TM, Tanoi K, Yokota H, Kang DJ, Ishii R, Ishioka NS, Watanabe S, Osa A, Sekine T, Matsuhashi S, Ito T, Kume T, Uchida H, Tsuji A. 2001. 18F used as tracer to study water uptake and transport imaging of a cowpea plant. Journal of Radioanalytical and Nuclear Chemistry. 249:503-507.
l Nakanishi TM, Don-jin K, Kitamura T, Ishii R, Matsubayashi M. 1999. Identification of water storage tissue in the stem of cowpea plant (Vigna unguliculata Walp) by neutron radiography. Journal of Radioanalytical and Nuclear Chemistry. 242: 353-359.